Alexey is an Associate Director in our Moscow office. He is a member of our Automotive and Manufactured Goods Practice. He is focused on topics of Strategy, Organization & Transformation, Operations Management, and Technology & Innovation Management. Alexey is an expert in the aerospace and industrial manufacturing industries. He also has experience in electronics, TMT, consumer goods, the financial sector and utilities. He has worked repeatedly with Russia’s largest companies and government bodies, as well as with international corporations. 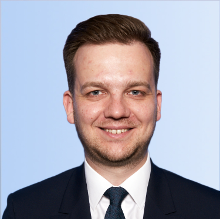 Alexey is focused on establishing long-term relations with clients and always tries to be not only an advisor to his clients, but also a co-leader in implementation. Before joining Arthur D. Little, Alexey worked for 12 years in Russian consulting companies and accomplished over 50 projects on strategic, operational and commercial issues in various sectors. Alexey also gained experience in several technological and IT companies. Alexey holds a master’s degree in applied physics and mathematics from Moscow Institute of Physics and Technology. Alexey is married and has two children. They live in Moscow. In his free time, Alexey reads and swims.